Hermóðr rides to Hel on Sleipnir. He meets Hel and Baldr. The term Hel (meaning "to bury," and "grave")   is used in Norse mythology to refer to both the realm of the dead and to its queen. As a realm, Hel is described as a cold, shadowy place, inhabited by the souls of individuals who died in a so-called 'cowardly manner' (i.e., not in battle). In this way, it can be seen as the polar opposite of Valhalla - Odin's hall of perpetual feasting, whose doors only open for those slain in conflict. As a deity, Hel is the overseer of this twilight realm. A daughter of Loki, she is cold, aloof and indifferent to the suffering of her constituents (as evidenced by her role in the saga of Balder's death, among others). In some ways, Hel is similar to the Judeo-Christian idea of Gehenna (Hell) because both concepts can refer to a subterranean realm of punishment, albeit the Norse Hel is a cold place whereas the Gehenna of the Hebrew Bible is a hot, burning pit. As Christianity spread into northern Germanic and Scandinavian lands, the somewhat similar ideas of "Hel" and "Hell" fused together, and today, the word "Hell" in the English language comes from "Hel." As a both a Norse deity and a realm in the Norse mythic cosmos, Hel belonged to a complex religious, mythological and cosmological belief system shared by the Scandinavian and Germanic peoples. This mythological tradition, of which the Scandinavian (and particularly Icelandic) sub-groups are best preserved, developed in the period from the first manifestations of religious and material culture in approximately 1000 B.C.E. until the Christianization of the area, a process that occurred primarily from 900-1200 C.E.. The tales recorded within this mythological corpus tend to exemplify a unified cultural focus on physical prowess and military might. Within this framework, Norse cosmology postulates three separate "clans" of deities: the Aesir, the Vanir, and the Jotun. The distinction between Aesir and Vanir is relative, for the two are said to have made peace, exchanged hostages, intermarried, and reigned together after a prolonged war. In fact, the most major divergence between the two groups is in their respective areas of influence, with the Aesir representing war and conquest, and the Vanir representing exploration, fertility, and wealth. The Jotun, on the other hand, are seen as a generally malefic (though wise) race of giants who represented the primary adversaries of the Aesir and Vanir. Hel, whether understood as the goddess of the dead or the realm where their spirits reside, is a clear indication of the place of (non-battle-related) death within the Norse worldview, due to her predominantly negative characterization. She is half blue-black and half flesh-color (by which she is easily recognized), and very lowering and fierce. Her walls are exceeding high and her gates great. Her hall is called Sleet-Cold; her dish, Hunger; Famine is her knife; Idler, her thrall; Sloven, her maidservant; Pit of Stumbling, her threshold, by which one enters; Disease, her bed; Gleaming Bale, her bed-hangings. Yet more children had Loki. Angrboda was the name of a certain giantess in Jötunheim, with whom Loki gat three children: one was Fenris-Wolf, the second Jörmungandr—that is the Midgard Serpent,—the third is Hel. But when the gods learned that this kindred was nourished in Jötunheim, and when the gods perceived by prophecy that from this kindred great misfortune should befall them; and since it seemed to all that there was great prospect of ill—(first from the mother's blood, and yet worse from the father's)—then Allfather sent gods thither to take the children and bring them to him. … Hel he cast into Niflheim, and gave to her power over nine worlds, to apportion all abodes among those that were sent to her: that is, men dead of sickness or of old age. At Holtar, must obey grim Fate. They laid the hero in the ground." Riding upon the horse of Fate. Brave Dygve from the light of day." However, the most famous of the accounts describing Hel's stewardship of the deceased is certainly the tale of Balder's untimely death. 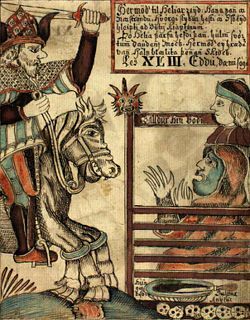 In it, Hermódr is dispatched by Odin to the realm of Hel to plead with its queen to return the beloved god to the realm of the living. The cold-hearted ruler replied that "in this wise it should be put to the test, whether Baldr were so all-beloved as had been said: 'If all things in the world, quick and dead, weep for him, then he shall go back to the Æsir; but he shall remain with Hel if any gainsay it or will not weep.'" In the end, a single giantess refuses to shed a tear for the lost god, and this is sufficient for Hel to retain her hold on him. It has been suggested that this description of Hel is of later date, and that she originally was a much more neutral goddess over the realm of shadows, where all, both good and evil, courageous and cowardly, gather after death. This can be seen as being supported by the etymology of Hel (Lat. Celāre, Ger. hehlen), meaning the "hider." It is important to note that also the noble Balder and the brave Sigurd are sent to Hel after their deaths. Likewise, Thomas Dubois also notes that "this generalized afterlife destination, depicted as cold, damp, and dark, appears typical in Scandinavian visions of the beyond." For around the walls | do serpents wind. There Nithhogg sucked | the blood of the slain. And the hound he met | that came from hell. Likewise, the entire tale told by Brunhild in Helreith Brynhildar (describing her courtship with the doomed Sigurd) occurs after her death, on the road to Hel (the title itself can be literally translated as "Brunhild's Hel-Ride"). This context makes her statement, "But yet we shall live | our lives together, Sigurth and I," all the more poignant. And with them the brother | of Byleist goes. To wade the torrent wild. ↑ John Lindow, Handbook of Norse Mythology (Santa Barbara, CA: ABC-CLIO, 2001), 172. ↑ Gabriel Turville-Petre, Myth and Religion of the North: The Religion of Ancient Scandinavia (New York: Holt, Rinehart and Winston, 1964), 271. ↑ However, in later sources at least, the posthumous judgment of an individual (and one's ultimate destination) was more based upon the moral circumstances of one's life than the specifics of one's demise. ↑ Lindow, 6-8. Though some scholars have argued against the homogenizing effect of grouping these various traditions together under the rubric of “Norse Mythology,” the profoundly exploratory/nomadic nature of Viking society tends to overrule such objections. As Thomas DuBois cogently argues, “[w]hatever else we may say about the various peoples of the North during the Viking Age, then, we cannot claim that they were isolated from or ignorant of their neighbors…. As religion expresses the concerns and experiences of its human adherents, so it changes continually in response to cultural, economic, and environmental factors. Ideas and ideals passed between communities with frequency and regularity, leading to and interdependent and inter-cultural region with broad commonalities of religion and worldview.” (27-28). ↑ More specifically, Georges Dumézil, one of the foremost authorities on the Norse tradition and a noted comparativist, argues quite persuasively that the Aesir / Vanir distinction is a component of a larger triadic division (between ruler gods, warrior gods, and gods of agriculture and commerce) that is echoed among the Indo-European cosmologies (from Vedic India, through Rome and into the Germanic North). Further, he notes that this distinction conforms to patterns of social organization found in all of these societies. See Georges Dumézil's Gods of the Ancient Northmen, xi-xiii, 3-25) for more details. ↑ Indeed, Lindow notes that many of these details are absent outside of Snorri's masterwork (172). ↑ 7.0 7.1 7.2 Snorri Sturluson, Gylfaginning XXXIV, Brodeur 42. The Prose Edda, Translated from the Icelandic and with an introduction by Arthur Gilchrist Brodeur (New York: American-Scandinavian foundation, 1916). ↑ Odin was the lord of those who perished on the battlefield (though in some sources Freyja is apportioned half of them). ↑ Ynglinga Saga (51), Heimskringla (Laing's translation). Retrieved May 18, 2018. ↑ Ynglinga Saga (20), Heimskringla Retrieved May 18, 2018. ↑ Sturluson, Gylfaginning XLIX, Brodeur 74. ↑ P. A. Munch, Norse Mythology: Legends of Gods and Heroes, In the revision of Magnus Olsen; translated from the Norwegian by Sigurd Bernhard Hustvedt. (New York: The American-Scandinavian foundation; London: H. Milford, Oxford University Press, 1926), 307. ↑ Thomas A. Dubois, Nordic Religions in the Viking Age. (Philadelphia, PA: University of Pennsylvania Press, 1999), 79. ↑ Indeed, the only means of differentiation between these usages is grammatical. As Lindow notes, "When older poetry says that people are 'in' rather than 'with' Hel, we are clearly dealing with a place rather than a person, and this is assumed to be the older conception" (172). ↑ See, for example, the "Fafnismol" (in the Poetic Edda), where one warrior says to another: "And, Fafnir, thou | with death dost fight, Lying where Hel shall have thee" (21), Poetic Edda, 377. Retrieved May 18, 2018. Here, Hel is simply being described as a posthumous destination, as Fafnir was evidently about to die in combat. ↑ Sturluson, Gylfaginning III, Brodeur 16. ↑ "Völuspá" (38-39), Poetic Edda, 17. Retrieved May 18, 2018. ↑ "Baldrs Draumar" (2-3), Poetic Edda, 96. Retrieved May 18, 2018. ↑ "Helreith Brynhildar" (14), Poetic Edda, 446. Retrieved May 18, 2018. ↑ "Völuspá" (51), Poetic Edda, 22. Retrieved May 18, 2018. ↑ "Grimnismol" (21), Poetic Edda, 93. Retrieved May 18, 2018. The Poetic Edda, Translated and with notes by Henry Adams Bellows. Princeton: Princeton University Press, 1936. Available sacred-texts.com online. Retrieved January 29, 2014. This page was last modified on 18 May 2018, at 21:49.